Kitchens were once designated for food prep only, but today they have grown into the social hub of the home, making it easy for consumers to cook, lounge, dine, entertain and more. When it comes to design, personalization is key for today’s homeowners. In fact, according to the 2018 Ashton Woods National Homebuyer Survey, 75 percent of those surveyed said they are more likely to select a builder that offers a variety of design options, and 67 percent said they are willing to pay more for those options. 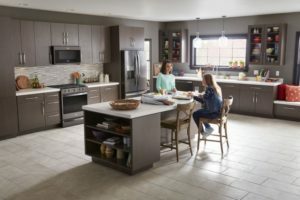 One of the trends that emerged from the 2018 Global Wellness Summit was wellness kitchens - people want the heart of their home to help further their healthy lifestyle. To embrace this trend, devote an area of the kitchen to showcasing fresh ingredients. Make space for healthy herbs like basil, mint and parsley - an indoor herb garden that can be accessed all year long. Any entertainer knows that parties can cause the kitchen to get messy fast. This is why “messy kitchens” are a growing home trend. Design the space to include a prep kitchen hidden from the main part of the room to keep visible clutter to a minimum during get-togethers. 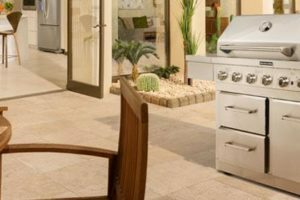 Include appliances to make it easy for consumers to host gatherings as well. For instance, the KitchenAidⓇ Smart Oven+ expands the creative horizons of a wall oven to include true indoor grilling, faster baking stone preheating and the ability to steam a meal for four all at once. Let’s not forget about happy hour, either. More than 75 percent of designers say that homeowners want separate wine refrigerators to store and display their vino, according to a National Kitchen and Bath 2018 Design Trends study. Americans are consuming coffee more than ever, with 64 percent drinking at least one cup every day. Zillow predicted that coffee carts will start to take the place of bar carts, which are expected to be used much more regularly. Dedicate a tight kitchen nook for coffee equipment, including space in the pantry or nearby drawers to store filters, grinders and other accessories. For smaller kitchens, incorporate built-in shelves to store coffee accessories vertically.